Erica Seccombe, Metamorphosis, 2016-2017 (single file detail) active stereoscopic projection installation. Pupa development at 15 degrees Celsius. 9 datasets from 10% to 100% growth 3D Micro CT.
Canberra artist, Erica Seccombe has been announced the winner of the 2018 Waterhouse Natural Science Art Prize with her video, Metamorphosis. The winner of the Open section was the video work Metamorphosis by Erica Seccombe. In the unanimous view of the judging panel, Seccombe profoundly captured the spirit of the prize with a work that took as its foundation the ordinarily unseen intersection between science and art. Metamorphosis represents a deep collaboration between scientific and aesthetic enquiry, with the tools of one being instrumental to the realisation of the other. While at one level the video documents the metamorphosis of a pupating fly, from maggot to fully formed insect, at another it works to enlarge our understanding of the mysterious cycles of life itself. Metamorphosis is a transformative, aesthetically beautiful time-lapse experience that provides a unique perspective of a virtual pupating fly. It is a result of Erica’s creative research into scientific visualisation of volumetric, or ‘virtual’ data acquired from 3D microcomputed X-ray tomography (3D Micro-CT) . This work is not mesh framed, nor surface rendered. Instead, the artist uses an open-source volumetric exploraton software Drishti developed by Dr Ajay Limaye at the ANU Vizlab and National Computational Infrastructure (NCI). Erica has been closely involved with this software development since its inception, and her research direction to incorporate time-lapse has informed this software ability. Metamorphosis responds to Erica’s 2015 residency in London at the Natural History Museum, where she observed the current forensic research into fly pupa development for post-mortem analysis using 3D Micro-CT. Maggots are more commonly associated with death and decay, but like caterpillars they undergo a period of transition before emerging as exquisite insects. The puparium is just one stage in many in the life cycle of the fly, and it has been difficult to measure because it occurs inside the opaque carapace. 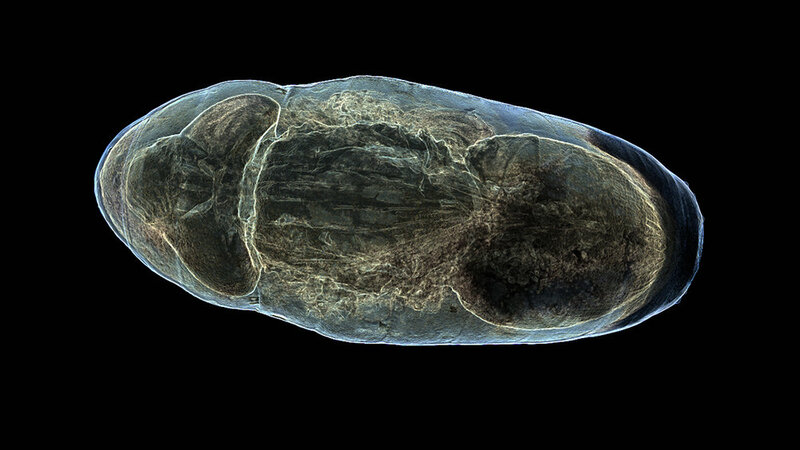 To capture and reveal this magical transformation of the pupa inside the larval carapace Erica worked with researchers to align ten static 3D Micro-CT datasets representing incremental stages of development. Using Drishti she then created a translucent surface and interpolated the data to make a moving image that reveals the subtle development of the internal and external features of the fly as a smooth time-lapse sequence. The making of Metamorphosis is undertaken though Erica’s own creative interdisciplinary research, and the benefits to the scientists studying larvae development has been of equal value.